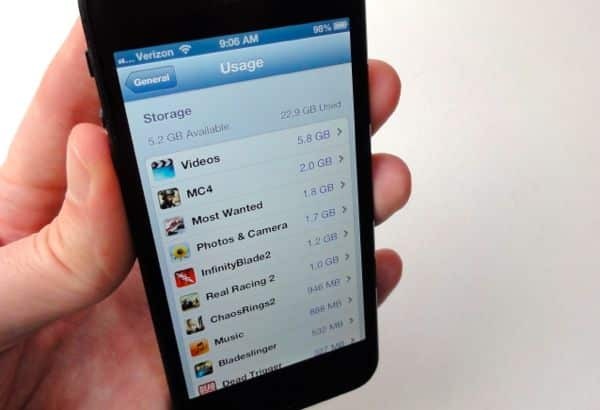 With all the hype over iCloud, it’s easy to forget that there’s a limited amount of “local” storage for all your apps, photos, music, videos, and other data. Download enough goodies from the App store or snap one too many photos, and you’ll eventually run out of storage space. If you worried that your iPhone (or iPod Touch, or iPad) is running out of room, don’t fret. Not only is it easy to check how much storage you have left, you can also see what’s hogging all your storage space. Finally, you can clear more room in just a few swipes. Tap the Settings icon on your iPhone (or iPad) home screen, then tap General, and finally Usage (it’s the third option from the top). Next, you’ll arrive at the Usage screen—and at the very top, you’ll see how much storage space is left on your iPhone, in gigabytes. After a few seconds, you’ll get a detailed list of the biggest storage hogs on your device, in descending order. See a jumbo-sized app that you could live without? Tap its name, then tap the red “Delete App” button. If you ever have a change of heart, you can re-download any free or purchased apps from the App Store. You can delete specific apps and videos directly from the Usage screen. Photos and videos shot with the iPhone’s camera may also be among the biggest storage hogs on your iPhone, particularly if you rarely (or never) delete snapshots from the Camera Roll. You can delete photos one-by-one from the Photos app (just tap Edit, Delete), or you can zap all your photos in one swipe once you tap the “Photos & Camera” entry from the Usage screen. Keep in mind, though, that any photos you delete will be gone for good—that is, unless you’ve synced them with iTunes or uploaded them to your Photo Stream in iCloud. Movies and TV shows can be deleted one-by-one from the Usage screen by selecting the Videos entry and tapping the Edit button; music, however, can only be wiped all at once, unless you start swiping from the Music app. (By the way: iTunes Match storage is managed automatically by your iPhone, which means specific tracks can’t be deleted individually. Strange, I know, but that’s the way it is for now.) And again, remember that you can always re-download and movies, TV shows, or music purchased through the App Store.